The first tool in the Charting toolbar is the Crosshair tool. This tool is helpful when lining up your technical indicators and recurring price patterns. Click the Crosshair button and position the crosshair on your chart and click your mouse. The crosshair draws a line vertically and horizontally on the chart. To help place the crosshair line on a specific value, the cursor price is displayed on the vertical line of the crosshair. There are two ways to delete the Crosshair tool. If your crosshair is selected (you've clicked on it and the box appears at the center point), you can press the Del (Delete) key on your keyboard. You can also place your mouse cursor over the crosshair and right-click. In the drop-down menu, select "Delete." If you only want to delete the horizontal or vertical line of the crosshair, select the crosshair by clicking on it and view the preferences in the control panel. Select or deselect "Show Horizontal (Vertical) Line." A check will appear in front of the item when it is selected. Select the crosshair by clicking on it. The properties will appear in the preferences section of your control panel. Crosshair Tool: You can choose the color, line style, and line thickness of your crosshair. Deselect Show Horizontal Line or Show Vertical Line to hide your lines. Font: Select the font, size, and color of the text. You can also choose to bold or italicize your text. Select the checkbox next to Show Text to hide or show your text on the chart. Select Extend if you would like your line to extend into the Indicator window. Select Snap if you want your crosshair to snap to price bars when moved. The remaining technical tools are used to identify technical analysis formations and trends. Take a look at the different patterns available then read about how to use each of the technical tools and apply the technical concepts learned. Select the line drawing by clicking on it. Press the Del (Delete) key on your keyboard. You can also right-click the line drawing and select "Delete" from the dropdown menu. Select the line drawing by clicking on it. The properties will appear in the preferences section of your control panel. Line Tool: You can choose the color, line style, and line thickness of your line. Parallel Extensions: Select from the dropdown menu how many lines you would like to add. Deselect Lock if you want to be able to move them independently. Select Linear Extensions to extend your line to the edge of your chart window. Select Snap if you want your crosshair to snap to price bars when moved. 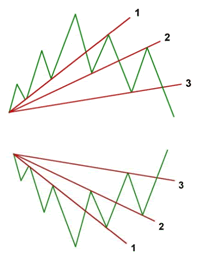 Some contracts will have a continuous line, or trend, of alternating support and resistance. To illustrate these multi-lines, select the Multi-Line tool from your Charting toolbar. Click on the chart where you want your line to start. Move your mouse to the next point on your multi-line and click to place. Repeat this until the last point. When placing the last point on the multi-line, right-click to finish. Select the multi-line drawing by clicking on it. You will know the multi-line is selected when boxes appear at the ends of the multi-line. Click on a box and drag it to your desired length. Release the mouse button to place. Select the multi-line drawing by clicking on it. Click on the multi-line, not a box, and drag it to the new location. Release mouse button to place. Select the multi-line drawing by clicking on it. Press the Del (Delete) key on your keyboard. You can also right-click the multi-line drawing and select "Delete" from the dropdown menu. Multi Line Tool: You can choose the color, line style, and line thickness of your lines. Font: Select the font, size, and color of the text. You can also choose to see numbers or letters. Select Show Text to hide or show your text on the chart. Select the 123 drawing by clicking on it. Press the Del (Delete) key on your keyboard. You can also right-click the 123 drawing and select "Delete" from the drop-down menu. Select the H&S drawing by clicking on it. Press the Del (Delete) key on your keyboard. You can also right-click the drawing and select "Delete" from the dropdown menu. Select the H&S drawing by clicking on it. The properties will appear in the preferences section of your control panel. Head and Shoulders Tool: You can choose the color, line style, and line thickness of your lines. A trend channel consists of a section of price bars that are between parallel support and resistance lines. There are three types of channels: the Narrow Sideways Channel, the Inclining Channel, and the Declining Channel. A Narrow Sideways channel is a formation that features both resistance and support with a sideways movement. Support forms the low price bar, while resistance provides the price ceiling. To trade a Narrow Sideways channel, place an order to buy on a break up and out of the channel, or sell on a break down and out of the channel. The Inclining channel is a formation with parallel price barriers along both the price ceiling and floor. Unlike the Narrow Sideways channel, the Inclining channel has an increase in both the price ceiling and price floor. The breaking of the bottom trend line on this formation shows a change in trend from bullish to bearish. To trade an Inclining channel, place an order to sell on the break down and out of the channel. The Declining channel is the exact opposite of the Inclining channel formation. The Declining channel has a decrease in both the price ceiling and price floor. The breaking of the top trend line on this formation shows a change in trend from bearish to bullish. To trade a Declining channel, place an order to buy on the break up and out of the channel. Illustrate a Narrow Sideways channel in a chart by selecting the Narrow Sideways Channel tool from your Charting toolbar. Position the mouse pointer where you would like to place the to top-left point of the channel and click. Continue to hold down the mouse and drag it to the bottom-right point of your channel. Release the mouse button to place. Select the Narrow Sideways channel by clicking on it. You will know the channel is selected when boxes appear on the corners. Click on a box and drag it to your desired location. Release the mouse button to place. Select the Narrow Sideways channel by clicking on it. Drag to the new location and release the mouse button to place. Select the Narrow Sideways channel by clicking on it. Press the Del (Delete) key on your keyboard. You can also right-click the channel and select "Delete" from the dropdown menu. Select the Narrow Sideways channel by clicking on it. The properties will appear in the preferences section of your control panel. The Raff Regression Channel was developed by Gilbert Raff. It features a linear regression line through the data with evenly spaced trend lines to create a trend channel. Identify a Raff Regression Channel by selecting the Raff Regression Channel tool icon from your Charting toolbar. The tool Icon looks like 3 parallel lines rising with a R in the top left corner. Position the mouse pointer where you would like to start the channel and click. Move to where you would like to end the channel and click there. Select the channel by clicking on it. You will know the channel is selected when boxes appear at the ends of the middle/regression line. Click on a box and drag it to your desired location. Release the mouse button to place. Restore Settings: These are buttons that show above the following image. TNT Default will change your settings back to the original software settings. My Default will change current settings to your personalized default settings. Apply To All Charts will apply your selected settings on all open charts. Save As My Default will save your current personal settings. Line Extensions: There is a checkbox to enable line extensions and a spinner box to select the number of bars they are supposed to be extended beyond the edge of the tool. There options for the extension line coloring, thickness, and style. Background: Here the background can be disabled and the color changed. Calculation: There are two types of calculations for the tool. Normal option is to put the upper and lower channel line on the maximum point away from the linear regression line (middle line). 2 Std Deviation option is to put the upper and lower channel lines 2 standard deviations away from the linear regression line (middle line). Trend Fans are an extension of the regular trend line. They accent simple trend line trading concepts by extending the single trend line to multiple fan lines that give a better look at a trend, its retracements, and market reversals. As a trend moves up in scale, a chartist will draw a line across price bar lows or, when a market is moving down, across the price bar highs. AAs the market continues to make its retracement, we can draw another trend line across the next level of support or resistance. The line is support if the market is moving up and resistance if it is moving down. The last move of the trend was resistance for the first trend line, and is now support for the second trend line. The third trend line shows that the market has made a solid retracement down past this third fan line. 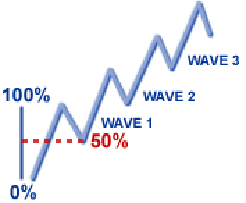 When the market crosses the third fan line, it is considered to be confirmation of market retracement. A market that was once considered bullish is now bearish, or if bearish, would now be considered bullish. When the markets price bars cross above or below the third trend fan line, this is your signal and confirmation that the market has shifted from bullish to bearish, or bearish to bullish. To trade a Trend Fan, place an order to enter the market on the break out past the third Trend Fan line.